Ottawa-Glandorf’s Kasey Ellerbrock puts up a shot against Kalida’s Brenna Smith during on Friday night’s game in Kalida. 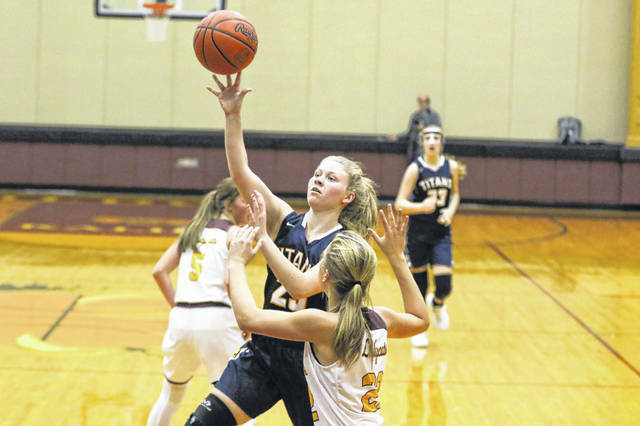 KALIDA — It took about four minutes for Ottawa-Glandorf to shake off its first game jitters against Kalida and once the Titans started to put it all together, the Wildcats were overwhelmed and fell 63-29 in the season opener for both teams Friday night. The Titans’ trademark smothering defense was the key to Ottawa-Glandorf recording the lopsided victory. Yant added that win was something to build on as he brings in some new players to the starting lineup. Ottawa-Glandorf shot 44 percent from the floor and the Wildcats were 30 percent from the field. Kalida head coach Adam Huber said he is playing some younger players this year and it showed early. Huber added that it is tough to run plays against such a physical and talented team like O-G. Both teams struggled to put points on the board in the first four minutes of the game and at the 3:30 mark, the Titans held a slim 5-2 advantage. That would be as close as the Wildcats would get as the Titans’stifling defense began to pay dividends. Thanks to some Kalida turnovers I the final three minutes, Ottawa-Glandorf closed out the first quarter with a 6-2 run to own a 11-4 lead after one quarter. The Titans continued its pressure defense into the second stanza and the Wildcats wilted and it would spark a 17-0 run to open up 28-4 advantage with 3:26 left in the first half and give Ottawa-Glandorf control of the contest. By the time the buzzer sounded for halftime, Ottawa-Glandorf held a 34-8 lead. The Titans scored 14 points off turnovers. A Titan 14-4 run to open the second half would quash any chance of a Wildcat comeback. In the decisive first half, the Wildcats had 21 turnovers with many resulting in easy transition buckets. Ten different Titans got in on the scoring. Kasey Ellerbrock led O-G in scoring with 17 points, including hitting four 3-pointers. Teammate Brianna Schimmoeller added 10. Kalida’s Grace Klausing finished with 10 points. Huber told his team that Kalida never eases into a season and they have plenty of time to improve but it will be tough in the early part of the season with a number of tough teams awaiting the Wildcats. This entry was tagged kalida, ottawaglandorf. Bookmark the permalink.